Of St. Louis State of Mo. Who is over the age of eighteen years. This is to certify that the undersigned, a Jewish Rabbi did at St. Louis in the State of Missouri, on the 26th day of May, 1912, unite in marriage the above named persons. The person performing the marriage ceremony will please insert after his signature the place of his office, church, or residence. 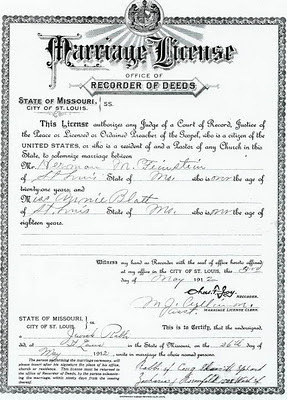 This license must be returned to the office of Recorder of Deeds by the person solemnizing the marriage within ninety days from the issuing thereof. 1. Zachariah Rosenfeld was Rabbi at Sheerith Sphard from 1897-1915 (source), and the location of the synagogue was 1500 Wash Street (source). 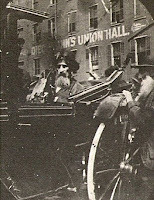 He was also Chief Orthodox Rabbi of St. Louis. A photo of him is on the left. 4. Herman and Annie's first child was born nine months later, in February of 1913.